This entry was posted in Quilting and tagged Brinton Hall Qult, Quiltmania Magazine. Bookmark the permalink. Hi Gretchen – missing your posts! Thx for the compliment. 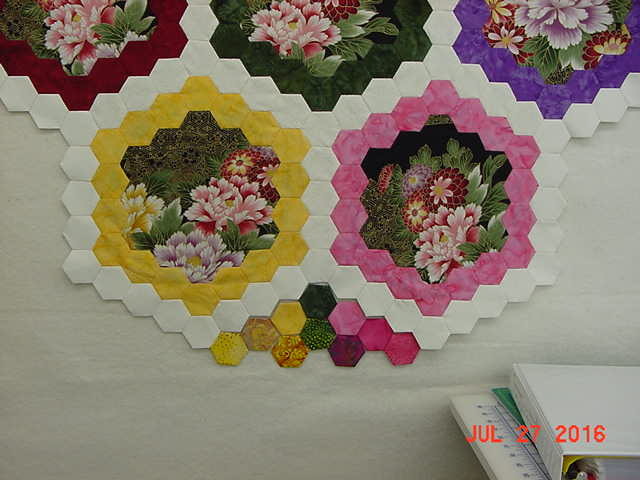 Yes as I was doing the post I thought – oops – may not work well, need to go back and put the one corner of hexagons up next to the quilt to see how it looks! It is so funny how one day things look good, then the next day, OOPS. Have a great week-end. Hope the weather is not too hot. I was happy to read this post! I am mired on the medallions; I did not pay close enough attention to the minimal directions, and sewed a row of cream hexies around each medallion – WRONG! Now I have to remove all of the cream hexies, and do it correctly. Then I can proceed with finishing the rest of the center! 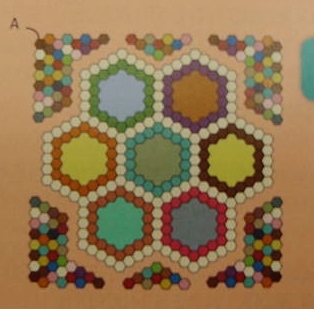 I had planned on a mixture of hexies to fill out the center, but now that I have read your post, I think I will make sure that I include a number of compatible hexies near each medallion. I will be watching for your re-design of the rest of the quilt! I ended up making 2 sets of medallions; one is all paisleys, and the second set is all florals. In one quilt, I will loosely follow the original plan, possibly changing some blocks for others used in the original borders, but the second one may well have a uniform 1 block pattern for the rest of the quilt, with lots of variety in terms of compatible prints. Such fun! 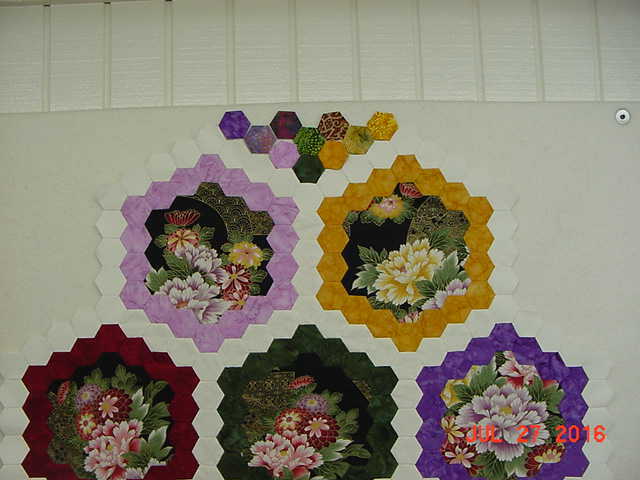 Glad that you like the idea of sewing a row of corresponding colors around the white around the large medallion hexagon! I am going to have to break down and start over on the corners. I hope that I have enough of the right colors to do what I want. 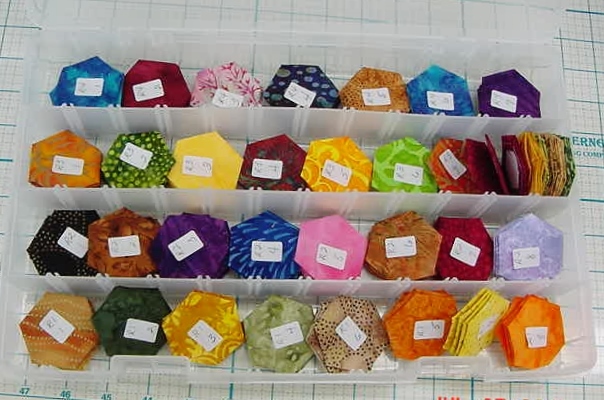 I must have made over 400 hexagons just using up the batiks that I used around the large blocks….I am going to totally redo the pattern with different blocks and borders. I love the original (found it on the web), but the blocks that the lady used in the remake are not what I would want. Have a great day and thank you for commenting. A delightful design to display large floral prints. Thank you Karen. Have a great day. These are just beautiful. This is such a good use of hexies. I fell in love with this pattern the minute I saw it in the magazine. Not sure how long it will take me to “get with the program” and complete it, but it will be fun – especially sewing all of the medallion to a background fabric…..Fun Fun Fun. Have a great day.